1. (verb) to be uneven. I moana tētahi taha o te rua (W 1971:204). / One side of the pit was uneven. 2. (noun) roof of a kūmara storehouse. 1. (noun) sea, ocean, large lake. Kei te mōhio katoa rātau ki ngā tauranga tāmure, tauranga tarakihi, tauranga hāpuku me ērā atu ika o te moana (TWK 54:3). / They know all the fishing grounds for snapper, tarakihi, groper and those other fish of the sea. Nō muri mai, ka tangohia e te taua moana roera o Aotearoa te rangi mō tā rātou hīkoi pōrori (TTR 1996:257). / Later the tune was adopted by the Royal New Zealand Navy as their slow march. Rokohina atu ko Te Arawa rātau ko ngā hōia a te kāwanatanga me ngā waka taua moana o Peretānia e tū mai ana (TTR 1994:152). / Te Arawa and the government troops, with British naval vessels standing by, came upon them. 1. (noun) sea horse, Hippocampus abdominalis - a quaint little fish usually mottled in browns. The body is narrow and strongly cross ridged on the sides. Head resembles a horse, but the tail is curled. 1. 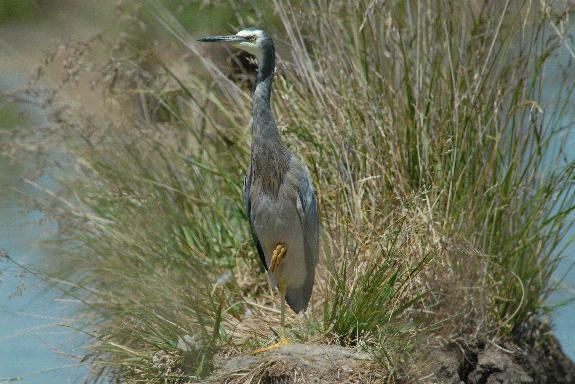 (noun) white-faced heron, Ardea novaehollandiae - a much more common heron than the rare reef heron. Bluish-grey with a white face. 2. (noun) reef heron, Egretta sacra - a slaty-grey heron with a long, heavy, grey to yellowish bill. Legs relatively short, yellow-green. Hunched and almost horizontal when feeding. Found in mangrove inlets, rocky shores, wave platforms and intertidal mudflats. 1. (noun) coast, foreshore and seabed. I tōia ki te awa ka mānu mai ki te takutai moana, ka tōia mā te waka ki Whāngārā (TTR 1990:16). / It was hauled to the river and floated to the coast, and towed by canoe to Whāngārā. Kei te kapi katoa a Papatūānuku i ēnei papaneke, ānō nei he pangahono. Ko ētahi he papaneke moana, ko ētahi he papaneke paparahi (RP 2009:311). / These tectonic plates cover the whole of the Earth, like a jig-saw. Some are oceanic plates, others are continental plates. 1. (noun) sea surface, sea level, sea horizon. I tana kitenga atu ka pūrero ake a Ahitereiria i te pae moana, ka tū ia, ka umere (TTT 1/8/1930:2115). / When he saw Australia projecting up from the sea horizon, he stood up and shouted. 1. (noun) ocean, open sea. I mua atu i a koe ko te kaipuke iti a Kāpene Kuku, ōna hoe he kōmaru, i whiti mai ai i te moana tuauriuri, tau ana ki ngā wai o Hauraki (TWM 27/5/1869:2). / Before you, it was Captain Cook's small sailing ship, its propulsion was with sails, that crossed the ocean and arrived to the waters of the Hauraki Gulf. Ka tae ana te waka ki te moana waiwai, ka puta te āwhā. / When the canoe reached the open sea the storm occurred. 1. (noun) sea-gooseberry, Pleurobrachia pileus - a free-swimming transparent animal resembling a jelly-fish, but with eight external bands of short comb-like structures which run from top to bottom of the oval or pear-shaped animal. The body is 15-50 mm long.